Last month I was chopping chillies and I don’t know how but, after chopping 8-9 chillies, I sensed major burning sensations on my hands. I felt like my fingers and both palms were burning. I waited for half an hour if it gets better but burning sensation was increasing and then I had to rush to the Doctor. He gave me calamine lotion and within 10 minutes, I was fine. If I talk about calamine lotion, I have used it many times earlier as well. I remember I was using it as a Face Moisturizer during my school days. Also I have used it over my legs when I had insects bite during my trekking and camping at Mt.Abu and last year used it for itching and skin allergy too. Honestly, Calamine Lotion is something I always keep handy along with my First Aid Box. I think it is one such helpful product that everyone must keep in the home and that’s why I thought about writing this post for all of you. I know, calamine lotion is a familiar term and some of you might have used it as well but, do you know all properties of it? What are benefits and uses of calamine lotion? Do you know about the formula and brands of calamine lotion available in the market? In this post, I will try to give you complete information about it. The formula of Calamine is quite simple. A mixture of zinc oxide with 0.5% of zinc compound or ferric oxide and some more added components is known as calamine. It gives cooling effect immediately after the application that is because of zinc oxide in it. Calamine Lotion usually comes in liquid lotion form, usually in light pink color. The consistency of Calamine Lotion would be runny and not so thick. Thus the application of it becomes very easy as well as it spreads well over the skin. What are the properties of it? Calamine lotion primarily used antipruritic and anti-itching agent and have mild antiseptic qualities. It is applied topically as an ointment. In September 2008, The U.S FDA approved calamine as a topical for counter skin protectant, both practical and harmless for usage. 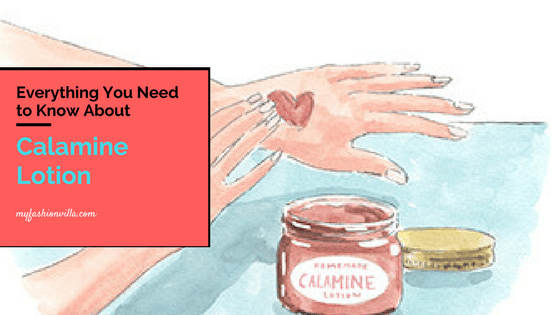 How to use Calamine Lotion? 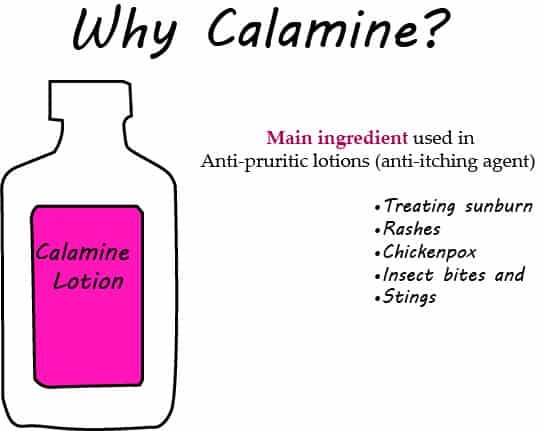 Calamine works by a counter-irritant effect. After topical application to the skin, the calamine evaporates and produces a cooling effect which helps you to distract from the itching. It also helps relieve sunburn. Calamine creams and lotions having the active ingredient zinc oxide. It has antiseptic properties, which prevent infection from scratching. Zine oxide also provides a soothing effect. It has skin protecting and astringent properties which relieve itching. It also slows down bacterial growth and hence prevents infections from deteriorating. Calamine contains an ingredient named as “Kaolin” that helps in giving radiant skin if it used regularly. Using it daily can improve your skin tone. Along with that it will lighten dark spots and keep your skin hydrated. It will give you an acne-free skin and develop the texture of your skin. Using it on the acne, you can to get rid of it quickly and safely. Before apply calamine lotion, wash your face with water and dry it. Next, take a cotton pad and put the lotion on it. Now, apply the lotion directly to the acne or a pimple. Stay it for a night and next day rinse it using ordinary water. Repeat this technique for 3-4 nights. It works best when it comes to fighting Eczema and other skin rashes. It is great for rashes and will give you relaxed and comfortable experience by applying a small amount on the affected area. Keep applying lotion for 2-3 times a day until the rash disappears. Calamine lotion and cream is known as an active product for decreasing red marks, acne scars, or any other kind of marks from a face and nourishes skin. Apply it all over your face like a moisturizer or can you use at only for overnight. Using it regularly, you will see a decrease in marks and clean skin. During winter the skin becomes dry and rough. By using it, it will balance moisture content of your skin. The kaolin and (Aloe Vera, if present) content of the cream soothes the skin efficiently and keeps it hydrated. In the market there are lots of manufacturers are available, so for your ease, we will list best calamine lotion here. Do You Need Prescription from Doctor to buy it? Many Doctors keep Calamine Lotion and prescribe it as well. But even without the prescription, you can buy it from chemist or Online. How to Apply Calamine Lotion? You can apply Calamine Lotion after, every 6-8 hours, directly over the problematic areas of your body. That’s all you need to know about Calamine Lotion. It is a very helpful product for itching, burning, for allergies, for acne and even as a lotion for your skin. I highly recommend this product to keep along with your first aid box and oral medicines at home.